« Older: El Gran Carnaval de San Pedro has started! 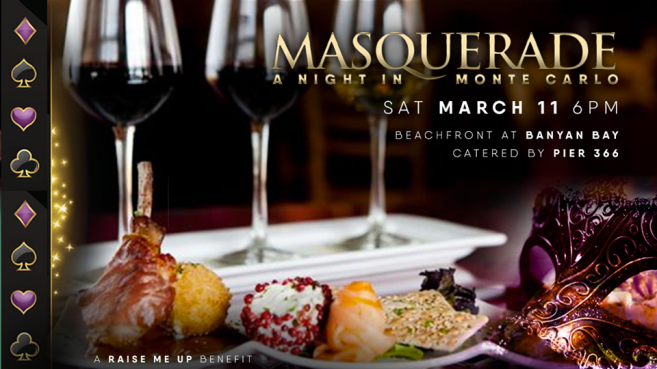 The non-profit organization Raise Me Up, will be hosting its most fabulous event of the year, a Masquerade Ball, on Saturday, March 11th. The event will directly benefit Raise Me Up and the San Pedro Lions’ latest project, Hope Haven, a children's home that will provide necessary services to women and children on the island. Tickets are $150 in advance, or $175 at the door. As quantities are limited, guests are encouraged to purchase tickets in advance. Tickets are available for purchase at Marbucks Coffee House and Rum+Bean. Everyone who purchases a ticket in advance will be eligible for a door prize, and valet parking will be available. The festivities will commence at 6PM at Banyan Bay Suites, and the highlight of the night is a performance by the talented Bobby Vandell of Abracadabra! Catered by Pier 366 Seafood House, a delectable menu will be paired with great wines. Every attendee will also receive chips for charity, allowing them to play table games, which include poker, roulette, blackjack, and craps! At the end of the evening, the top 10 chip holders will win the grand prize, which will be announced before the benefit ends. Rebuys are also allowed, so if you are willing to try your luck at one of the ten prizes available, they are valued at over $15,000 and worth a shot!